Summer is a slower time for the real estate market – buyers and vendors alike can be found on the beach rather than in the notary office – but work does progress. The largest piece of transactional news burst onto the market during the last week of June – after months of negotiations, the huge Kielce-based property developer, Echo, announced it had successfully purchased the former Brewery site on ul. Grzybowska in Wola in the centre of Warsaw. It is expected that circa 100,000 sq m will eventually be built on the four-hectare site – equating approximately to 1,000 apartments and 50,000 sq m of office space. In the same week, it was announced that the major shareholder in Echo, Michal Solowow, was considering an exit from the company – with the real estate market in such rude health, perhaps he views this as the optimal time to cash out? Krakow’s most famous development site has also been in the news in the pre-Summer months. 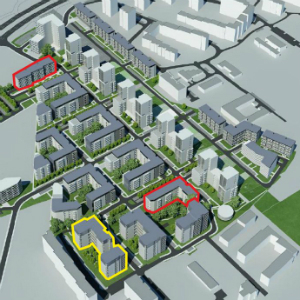 Almost nine years after buying the plot, the consortium of local-based GD&K and Middle-Eastern backed Verity finally have planning permission to go ahead with their Treimorfa project on the site of the NOT building (better known locally as Szkieletor) near Rondo Mogilskie. The development of the site will be phased and contain a variety of different uses. It is surely just a matter now of satisfying pre-sale/pre-let requirements in order to give the confidence to investors or financial institutions to start financing construction. In a blaze of publicity, Budimex Nieruchomosci have recently revealed plans to build out their residential site known as Nowe Czyzyny on ul. Orlinskiego in Krakow. The company is starting now with over 1,300 apartments (out of a total of 3,500 to be built). The economies of scale here surely help keep the lid on construction costs, and Budimex will use their own general contracting company for the build too, but the developer is being cautious on prices with a very attractive starting sales price of 4,000 PLN per sq m. There is no doubt that such a large and relatively cheaply-priced scheme will have an impact on the Krakow market – particularly on the East side of Krakow. Given the huge number of apartments and the relatively close due-date for completion, it is also suspected that a decent proportion of the flats may be pushed into the BGK residential buy-to-let fund. Closer to the city centre, Balmoral Properties have announced the construction of the second and final phase of Browar Lubicz. Large Polish concern, Warbud, have been selected as the general contractor for this phase, taking over from Austrian contractor, PORR, who were responsible for the first phase build. The second phase will consist of 164 apartments (10 percent of which have already been sold) with prices ranging from 8,500 to 12,750 PLN per sq m, as well as 5,000 sq m of A-class office space, of which 1,000 sq m has already been pre-let to a local software company. Warbud are currently preparing the working drawings and construction on site is likely to begin in September with completion in Summer 2016. Much has been made over the past two years of the consolidation of the residential real estate development market and the disappearance of smaller development companies. Smaller companies were expected to become casualties of the so-called Developers’ Act, not having the human resources or financial wherewithal to deal with the various additional stipulations of the new legislation. As they say, though, ‘Polak potrafi’ and smaller projects are still springing up. A great example is the small residential scheme being built at ul. Ptasia 14 in Olsza by local entrepreneur, Ernest Mlynarski. This cosy development of 18 apartments (five already reserved) is due to complete in a year’s time and has prices ranging from 187,000 PLN for a one-bed apartment to 400,000 PLN for a three-bed on the top-floor. While the market will surely slow down during July and August as we all take a breather, September will wake us all up with a holt in the real estate industry as these projects – and many others too – march on. Krakow is still full over overpriced, sub standard, undersized, poorly constructed apartments. You need to pay over €350K to get an apartment which would be comparable to any normal apartment in a city in the western world. Your spell comment as commnet. The Krakow market may be overpriced but they are still a bargain compared to other “western” property markets.